Once you link the People app with your online social networks on your Surface, your People app then stocks itself with your favorite people from Facebook, Twitter, LinkedIn, and other networks. 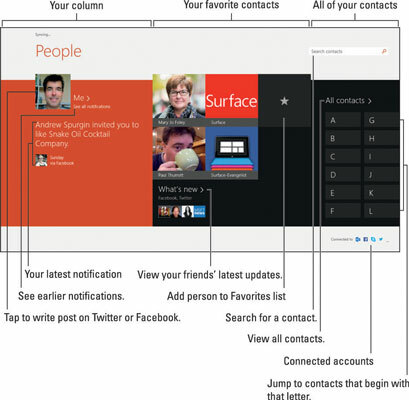 To see them, open the People app with a tap on its Start screen tile. The People app appears, listing every friend grabbed from your online social networks. And, in keeping with the latest computing trend, People alphabetizes your contacts by their first names. Your friend Adam Zachman finally appears first. The People app updates itself automatically, adding and dropping people as they enter or leave your social networks. It also lets you mark people as Favorites so their tiles appear front and center for easy access. If you create an extraordinary cat photo, you can post it directly onto Twitter or Facebook by tapping your own entry in the People app and then filling out your personalized What’s New section. The People app’s reliance on social networking comes with a downside, though. Friends who don’t share their lives through a social network stay out of reach of the People app. Also, networks such as Facebook contain huge switchboxes full of privacy controls. Some of your friends may have flipped a Facebook switch that keeps their information sequestered in Facebook’s walled garden, safely hidden from the People app. The point? You eventually need to remove your gloves and manually add or edit entries in the People app. The People app’s first column shows your profile photo and your notifications. The second column shows people you’ve marked as Favorites, making them easier to access with a tap on their profile photos. The third column displays only letters; tap a letter to jump to the contacts beginning with that letter. To see everybody’s latest updates from Facebook and Twitter, tap the What’s New link in the bottom of the second column. Tapping your way through the People app’s What’s New section can lead you to friends, their adventures, and even the adventures of your friends’ friends. If you’re feeling lost in a sea of people, slide your finger up from the screen’s bottom edge and tap the Home button. That takes you back to the front page.